CINCINNATI (AP) — Paul Goldschmidt hit two of Arizona’s five homers, and the Diamondbacks avoided a sweep by pounding the Cincinnati Reds 9-2 on Sunday. Daniel Descalso, Eduardo Escobar and David Peralta also connected for Arizona, and Zack Godley pitched 6 2/3 innings of two-run ball. Goldschmidt finished with three hits and three RBIs, and Peralta also drove in three runs. Godley (13-6) snapped a tie with Zack Greinke for the team lead in wins. The right-hander allowed six hits, struck out six and walked one while improving to 5-0 with a 3.09 ERA over his last six road starts. The Diamondbacks were tied with the Dodgers for the NL West lead coming into the day. Last-place Cincinnati had won three of four, including the first two games of the weekend series. 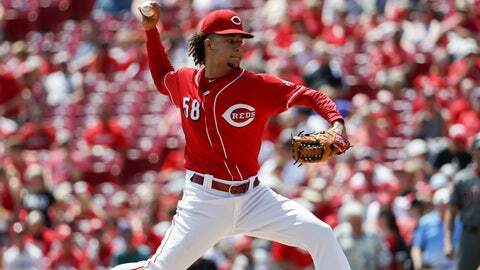 Jose Peraza and Eugenio Suarez each had two hits, but Luis Castillo (6-10) was tagged for five runs and five hits in 5 2/3 innings. Homers accounted for each of Arizona’s runs. Descalso hit a three-run shot in the first, and Goldschmidt made it 5-2 with a two-run drive in the sixth. The Diamondbacks added four more runs off Keury Mella in the ninth. Escobar hit a two-run shot, and Goldschmidt and Peralta added back-to-back homers. Joey Votto drove in Peraza with a sacrifice fly in the third. Cincinnati scored its first run when Arizona shortstop Nick Ahmed committed a throwing error on a potential double-play ball in the second, allowing Suarez to score from second. Diamondbacks: Greinke (12-7) starts Monday night at Texas against Bartolo Colon (6-10). Greinke has allowed a combined three runs over 13 innings in his last two starts and lost both. Reds: Injury-plagued RHP Homer Bailey (1-9) makes his first start against Cleveland since Aug. 7, 2014. Mike Clevinger (7-7) pitches Monday night for Cincinnati.